Thank you for all the lovely comments and emails I received after my last post. I know it was a bit heavy and I am sorry about that. I've had a much better week so far and am in a much more positive place. So, to celebrate positivity, here are some brownies. As a quick note, I entered my Chocolate Raspberry Cinnamon-Sugar Challah Bread Sweet Rolls into Buns in My Oven's What's Cooking Wednesday linkup. For some amazing looking food, head on over there. Now, back to these brownies. I made these for my roommate Marnie who absolutely loves Maltesers. I made these AGES ago and never got around to posting them. They were for her birthday last year, which I never even mentioned on the blog. 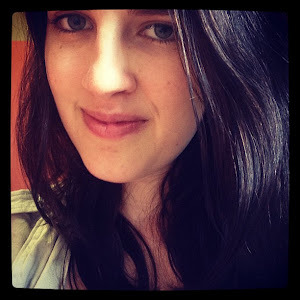 So, Marnie - I hope this post reminds you that about these amazing brownies. And I hope you remember how much I appreciate you and love living with you. Living in Brisbane just wouldn't be the same, and I'm so glad we're both bad with directions. For those who don't know, Marnie and I met the first day of university ever, when we were both hopelessly lost and confused. We're both from small towns, have great families and value the same things. We've been friends ever since. So as you've probably noticed, I make an awful lot of brownies. I absolutely adore them. These brownies do not follow my base recipe, but instead are a new base recipe. They still taste amazing and are not only easy to make and clean up, but look fantastic. 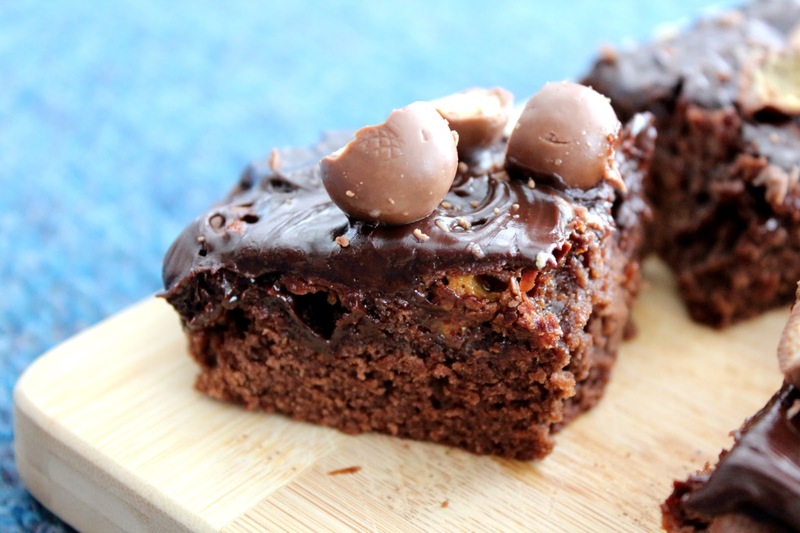 These guys are fudgy, dense and chewy (like all good brownies - but admittedly, not quite like my other ones). 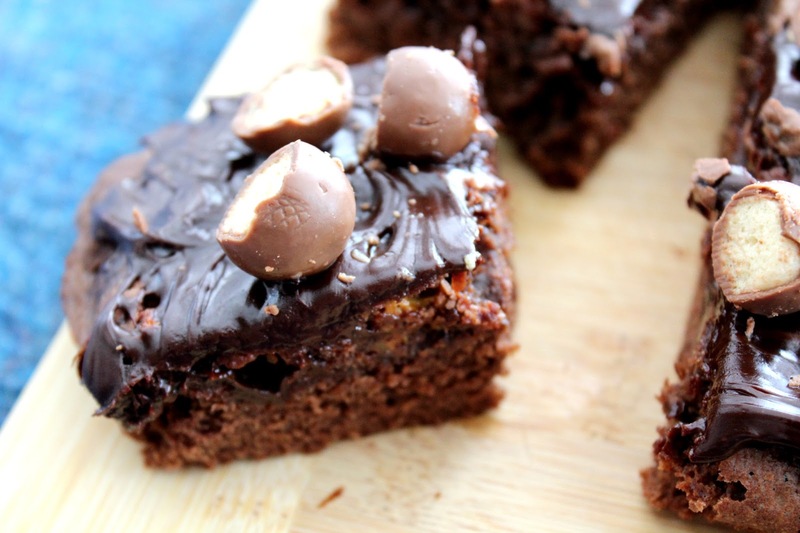 They have a slight crunch both inside the rich centre and on top; the Maltesers give them this fantastic malt kick in addition to this crunch. Furthermore - that ganache is to die for. Very simple, but very rich. 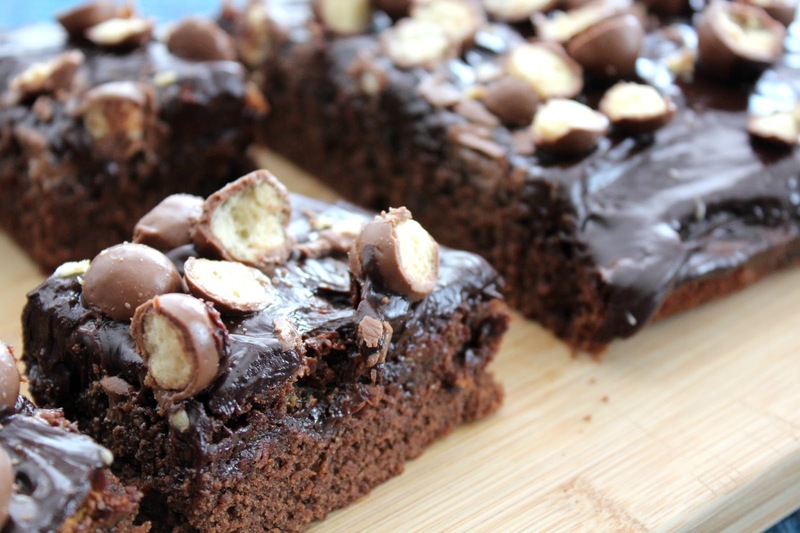 The richness of the brownies and ganache is offset by the sweet milk chocolate and malt from the Maltesers. You need to trust me on this one and make these guys. SOON. 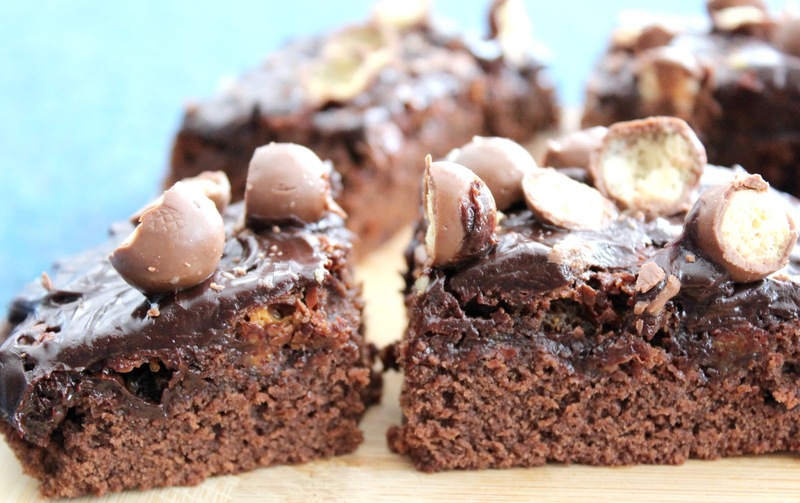 Level of difficulty: These brownies are like all of my others – easy, delicious and fudgy. Very simple. Menu Options: Now Maltesers can be found in most European countries including the UK and in Australia. But I don’t know how widely available they are in other countries and I can only assume as to what would be a suitable replacement for them. 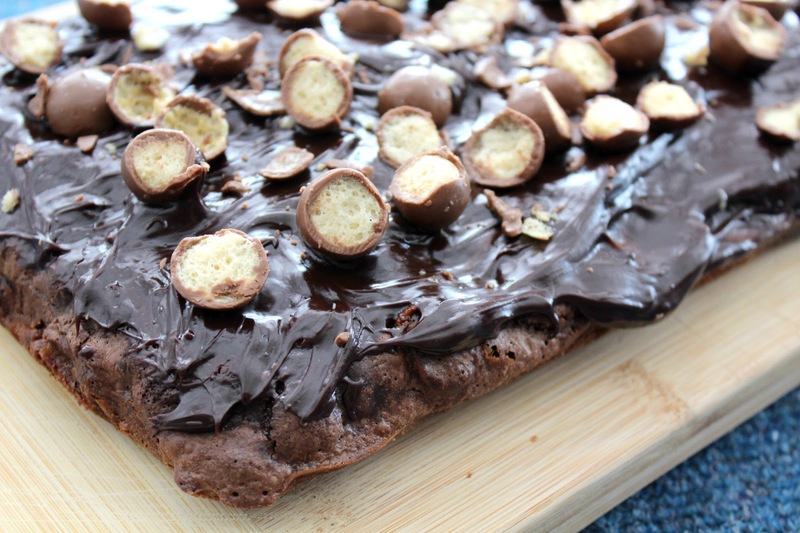 Maltesers have a malt honeycomb centre which is covered by milk chocolate. So, I think, in America a replacement would be Whoppers. I would try using them anyway. Otherwise, no other replacements are needed in this recipe. While this recipe is an original it was inspired by ShugarySweets, Picky Palate and OK! - all of whom made brownies with sweets in. Preheat the oven to 180 degrees Celsius. Grease and paper a brownie tin (whatever size you usually use is fine) and set aside for later. Melt the butter and chocolate together in a microwave safe bowl at 30 second increments until melted together. Whisk together well. Sift the flour and cocoa powder into the bowl. Add in the sugars and combine well, using a whisk or wooden spoon. You can mix all of these ingredients together at once. Add the eggs, one at a time, whisking as you do. 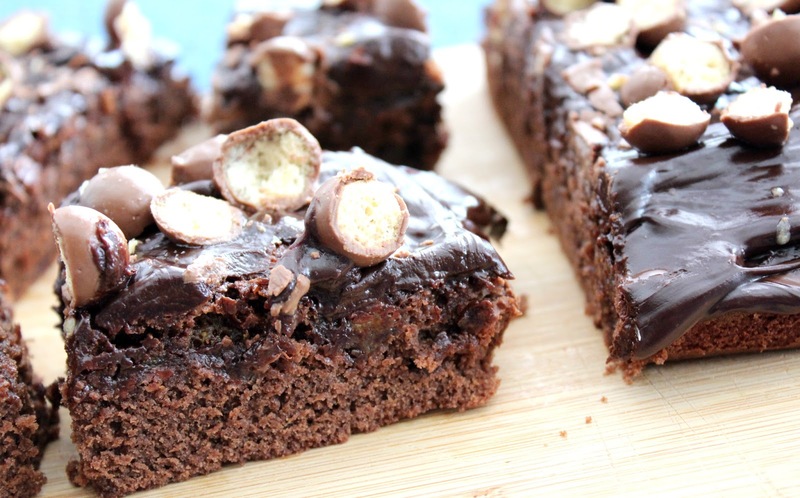 Make sure there are no streaks of flour or egg in the brownie mix. 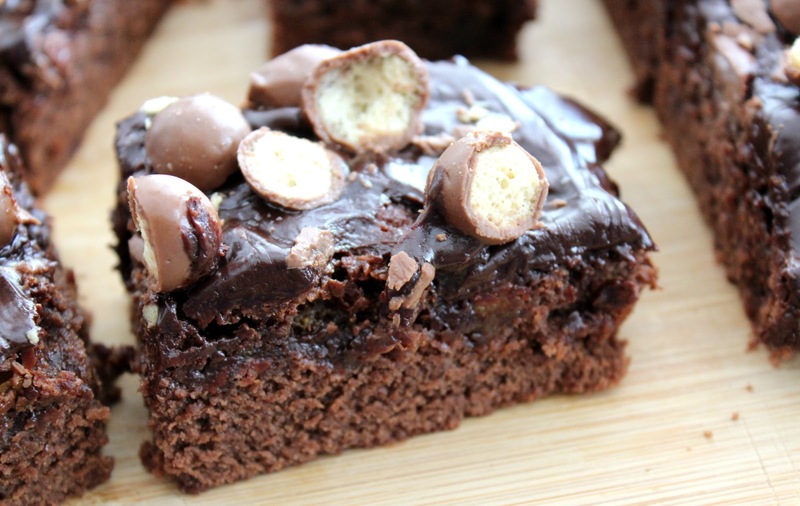 Add the one cup of chopped Maltesers to the brownie mix. They do not have to be chopped neatly; just broken in any which way works fine. Stir in the Maltesers using a wooden spoon. Do not feel the need to stir them in too much, as you do not want to overmix the batter. Bake the brownies in the oven for 20 minutes. Remove brownies and allow them to cool. Once they have cooled, at least slightly (say half an hour), make the ganache. Over a stove on low-medium heat, combine the cream and chocolate in a saucepan. Stir the mixture continuously until the cream and chocolate have melted together, creating an oozing chocolate coloured ganache. Take the ganache off the heat and allow to cool slightly. This will thicken the ganache, as when it is on the heat it is quite thin. Do not allow the ganache to cool fully, but allow it to thicken. Once you thick it is still easy to pour but rather thick, spread the ganache evenly over the brownies. I recommend using a spatula to do this, as that way you will get all of the ganache from the saucepan and it will spread evenly across the top of the brownies. Top with the remaining Maltesers from the bag. You can chop these or leave them whole (though chopping them is prettier). Serve as you please – warm or cold, these brownies are amazing. Oh my these look fantastic!!! Are Maltesers just malted milk balls? If so, then these have to be fantastic!! These look delicious! 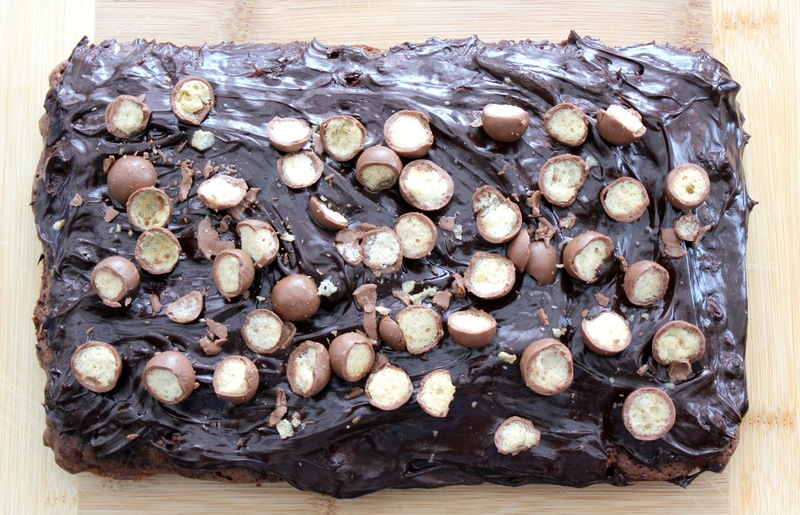 Josh has an insane love of malteasers so I think I will have to make a batch up this weekend! The history of bakery products dates back to the Roman Empire, from where these products have attained phenomenal comfort food recipes The baked goods, which were delicacies during feasts and weddings, have now occupied the shelves and storage of almost every household. 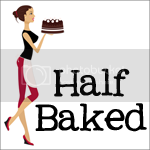 The subsistence-focused baking that was prominent during the medieval period has essentially occupied a choice-based approach.